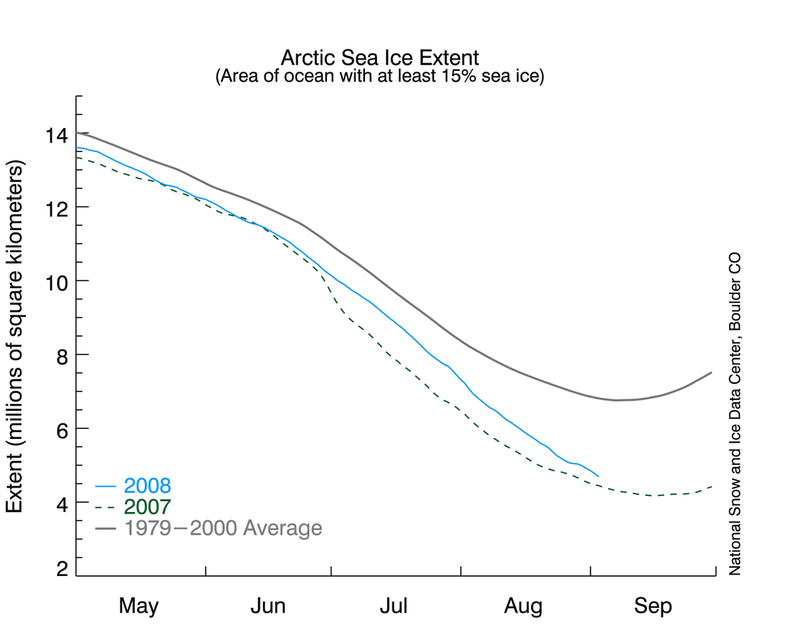 Sea ice extent in the Northern Hemisphere has exhibited large and anomalous declining trends over the last several decades. In particular, there has been over a 20% decline since 1979. Linear trends in arctic sea-ice extent since 1979 are negative in every month.Recently, there has been particular interest recently over a record-breaking year in 2007 which flew by the second-lowest year in 2005. There also has been a foot-race this year, which has kept me particularly interested over the last few weeks. For a while, it seemed that 2008 would clearly not surpass 2007, but due to the drop over the last few weeks, that may not be the case (although it probably will be). 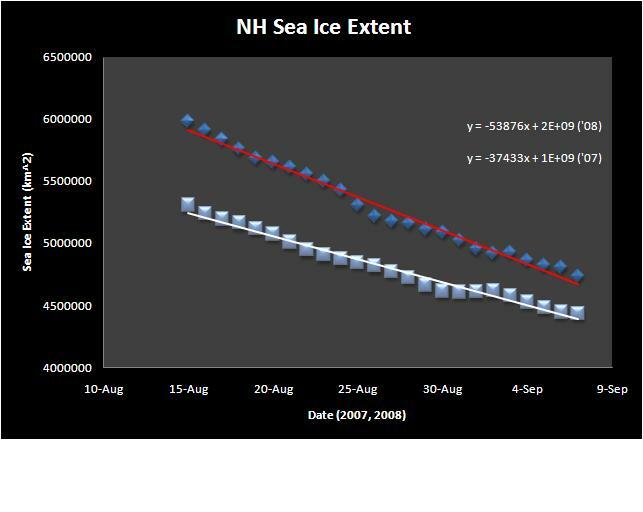 Sea ice extent as of September 7, 2008 is 4,739,844 km2, while 2007 minima reached 4,267,656 km2 on September 16th last year. For much of the year 2007 was lower than 2008 in extent, however, there has been a 38% increase in the rate of decline from August 15 to 31 (2008) compared to August 15 to 31 (2007), even though the 2007 absolute values are lower. With maybe a week to go in the melt season, and because the daily decline rate has remained steadily downward and strong, we’ll probably end up neck-to-neck with last year. 4, 258, 293 km2 which is right near last year’s low. Visually, you can get a feel for the geography of decline in August 07, 08 and September 08, with the line representing the September 1979-2000 average. No one has succeeded in explaining the observed warming and sea-ice loss in the Arctic solely using natural variability; the changes are large and fast, and consistent with warming. Natural variability is large in the Arctic, however. From the 1970’s to the mid-1990’s, the North Atlantic Oscillation, (which is a seesaw in atmospheric mass between the subtropical high and the polar low and a dominant form of variability in winter in the North Atlantic) shifted to a positive phase whic favors enhanced transport of ice away from the Siberia and Alaska, and coastal areas in spring are left with an anomalous coverage of young, thin ice. The NAO is is probably responsible for at least half of the ice volume export from the early eighties into the late nineties (Hilmer and Jung 2000, with potential anthropogenic influences on the NAO). First-year ice is much more sensitive to melt that multi-year ice, and 2008 also featured a lot more young ice than previous years. The trend over the last couple of decades has been a significant shift toward more young ice. When it warms, ice off of Siberia is the first to go since the dominant drift of the ice is from here across the pole to Greenland where is compresses and other areas become more difficult to melt. However, since the NAO has reverted back to a neutral phase over the last decade, it cannot explain the recent warmth and anomalous ice loss lately. A paper in GRL this year by Zhang et al., What drove the dramatic retreat of arctic sea ice during summer 2007? attempted to give insight to factors involved in the large decline. Their conclusions show that spending years and years in a warming climate has pre-conditioned the ice to more melt, and ice-albedo feedbacks and anomalous wind patterns for increased ice export has helped out. Persistent southerly winds have given rise to above-average temperatures north of Siberia which have resulted in direct melting and advection. Top melting of ice is governed by the surface energy balance, and bottom melting is governed by the heat in the upper ocean and the transfer of that heat to the underside of the ice. Warming air temperatures have been observed over the past several decades by buoys and satellites (e.g., Cosimo 2003), the mean thickness of ice has decreased by over half a meter, and changes in energy fluxes. There was large increases in bottom melting in the Beaufort sector (North of Alaska and Canada) 2007, caused by solar heating due to large amounts of open water (Perovich et al., 2008; GRL). According to Shimada et al., 2006 warm Pacific water inflow has played a role as well in certain areas. Overall, the Arctic is warming faster than the global average, the ice is melting (and in fact faster than our models suggest now), and is indicative that we are in a new climate. Warmer air temperatures, changing wind and circulation patterns, increaed ocean heat content have all played a role in this. Aside from curiositiy, it is not very important whether this year or next will beat the 2007 september minimum, as the trends are very clear. 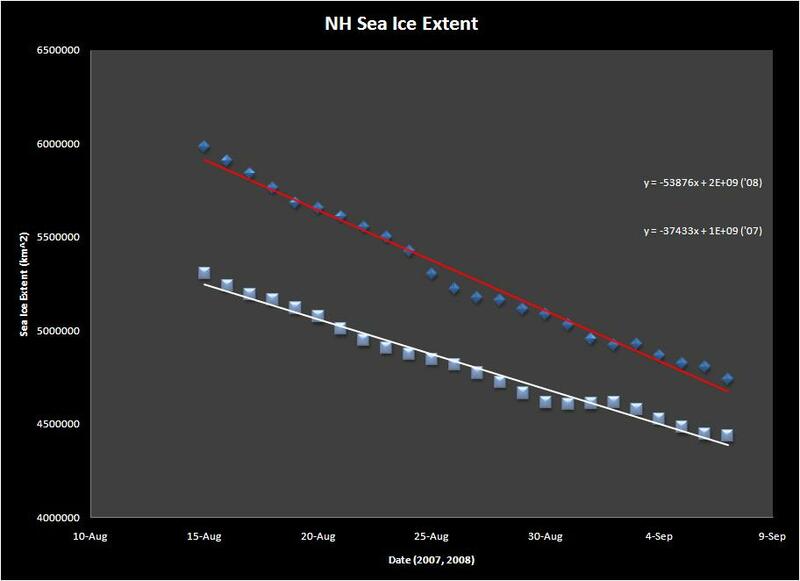 However, this may be a sign that 2007 in the Arcic was not like 1998 global temperatures, but rather more 2007’s will be the norm in the near future, and seasonally free NH sea ice can come any year now. This entry was posted in ecology/impacts, glaciers, scientific basis, what is global warming?. Bookmark the permalink. The implications of all this are likely to be profound. Wasn’t there a recent study on permaforst behaviour following sea ice loss?